Passage Point -- December and New Year Week Available! Enjoy the spoils of this gorgeous, well-maintained condo located in the Heart of Copper Mountain Village. Sit on our private 5th floor balcony and enjoy views of Copper Mountain Village and the surrounding mountains, or relax by the fireplace after a full day of mountain activity. You've got EASY access to all the unique shops and restaurants, the outdoor climbing wall, the golf course, the West Lake, and the two Center Village High Speed Quad Chairlifts. Accommodations in this beautifully furnished home include a king bed in the master bedroom (which features an en-suite bath) and a unique layout in the guest bedroom - a queen-size bed plus twin bunk beds! It's just great for a second family with kids! Additional sleeping for two more adults is provided on a very comfortable queen sleeper sofa. 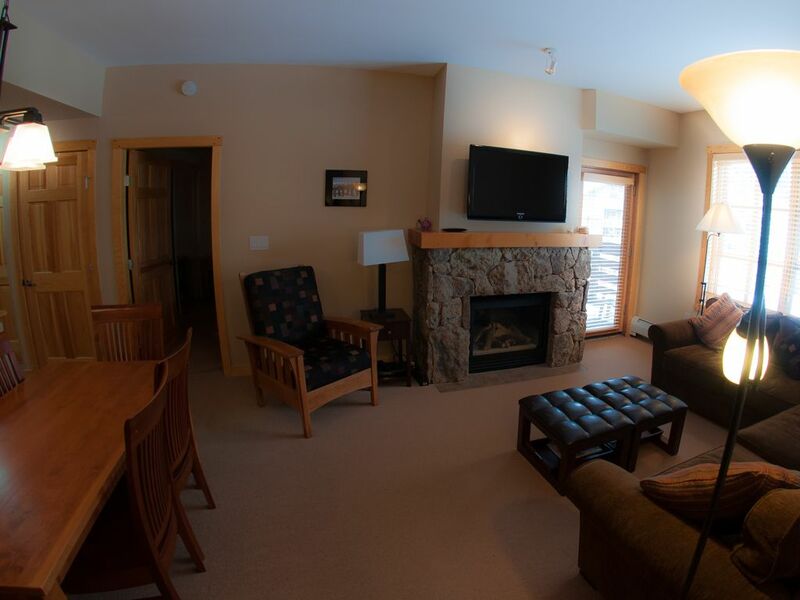 This unit has got it all: Full kitchen, VCR/DVD/CD player and Cable, telephone, WIFI, Gas Fireplace, Private Balcony with Gorgeous views over the resort, TV's in the Master Bedroom, Living Room and Guest room, and private underground parking! Enjoy the property's two heated swimming pools and jacuzzi, exercise room, laundry room, and children's play area. ABOUT COPPER MOUNTAIN: Known as the 'Local's Favorite,' Copper Mountain is the largest ski and snowboard resort in Summit County. It is also the only ski resort that features naturally separated terrain, allowing beginners, intermediates and experts to ski and ride on their own distinct areas of the mountain. It's central location (situated between Breckenridge/Keystone to the east and Vail to the west) makes it ideal for the guest who wants to get out and enjoy other resorts as well. Perfect condo with everything we needed for a family ski vacation. Just a short walk to restaurants, shops, and 2 lifts. While we were there the new American Flyer lift wasn’t working and the new American Eagle lift malfunctioned several times but that is a poor reflection on Copper Mountain management and not this great condo. The condo was very clean and comfortable with nice updates. We found everything we needed in the kitchen and enjoyed the space. Clean and high quality property. This is a great place to stay in a condo that's clean and in great shape. It had everything needed for a wonderful week of skiing that was less than 5 minutes from the main slope. We will be back! This was a great condo, well equipped and in a great location. Transaction was smooth and owner was very responsive. Would definitely rent again and recommend. IF YOU WANT TO ENJOY THE BEAUTY OF SNOW MOUNTAINS, THE EASY WAY TO GO SKIING , GOING SHOPPING AND GO EAT AT GOOD RESTAURANTS CLOSE TO YOUR CONDO , THIS IS THE PERFECT PLACE TO STAY . THE CONDO HAS EVERYTHING YOU NEED AND MORE.